Who wants to be an airshow performer? The aggressive flying, cheers from the crowd, the chance to promote aviation and spreading joy are just a few of the benefits. Sean “Junior” VanHatten and I were given the chance to perform a routine in jet warbirds at The Airshow of the Cascades on August 25th & 26th, 2017 in Madras, Oregon. This is our story. I was at work one day in July and received a call from the Air Boss for the airshow, someone Sean and I both know. He asked if Advanced Flight Dynamics (AFD) would be interested in flying its jets in the airshow. “Of course we would!”, I said enthusiastically. “But I have to find out if it is possible”, I said as I did not have the final say on the matter. So began the process of working out the details, of which there are quite a few. I won’t bore you with those but realize that it does take some planning and work to get ready for an airshow, especially the first time around. We have 2 Fouga Magisters and access to an L-39 Albatross. It was decided to fly a Fouga and the L-39. My thanks to Sean as he saved the day taking care of the jets and paperwork necessary to get us ready for the airshow. Sean and I do not work at AFD full-time so this was an extra-curricular activity for both of us. Even though we have both done some pretty cool things in aviation, neither of us have performed in an airshow before. Sean flies in aerobatic competitions, so there is some similarity with the flying procedures. I have taken F/A-18s to a few airshows when I was in the Marine Corps, and I would get to do a fast overhead break and/or flyby when coming and going, but that was about it. Now we were being asked to fly a “routine” in front of the crowd. Unfortunately neither Sean or I had Statement of Acrobatic Competency (SAC) cards, so we were limited to 75 degrees angle of bank and 60 degrees of pitch. A little more than the standard allowed for non-aerobatic maneuvering, but still limiting. I didn’t have a formation card so formation flying was out this time. Even though I am a capable formation flyer, without a current approved formation card no formation can be flown in waivered airspace. So we planned a routine where we took turns doing various passes during our 10 minute window allotted. Friday is an evening and night show with the performers brief at 4 p.m. Sean and I tried to arrive before 2 p.m. but unforeseen circumstances delayed us and we arrived in Madras at approximately 2:45. We arrived in formation and performed a climbing Fan Break, which looks really nice. This is an overhead break where both aircraft start turning at the same time and separation is created in the turn downwind. When we arrived we had to sort out fueling and get our ramp check by the FAA representatives. Thankfully that all went well since as soon as that was done we were off to the performers brief. Lessons were learned here, such as being as early as possible so you won’t be rushed trying to get everything done. Any paperwork or airplane issues could have prevented us from performing Friday evening as there wouldn’t have been time to fix them. The performers brief went well and then we had a little time to mingle at the airshow. I had a lot of family attend so I greeted them and others, and before I knew it, it was time to get ready to fly. Sean and I went over the routine again and then started up the jets when it was time. Next thing we know we are being told its time to taxi and then cleared to takeoff earlier than planned. That all went much faster than anticipated due to darkness rapidly approaching. The moral of the story is be ready early! Thankfully we were able to keep up with the accelerated pace and take off as soon as we were cleared by the Air Boss. This prevented an unwanted lull in the action for the crowd and allowed us to get our routine flown before complete darkness. We flew our routine without a hitch and it looked pretty good, especially since it was done with no practice. After landing we shut down the jets at show center and received a great applause from a happy crowd, which was much appreciated. After flying it’s great to get back in the crowd and be available to talk to spectators. Saturday was the day show. We were there all day. Show up at 8:30 a.m., breakfast at 9 a.m., and a 10 a.m. performers brief. Next hang out by the jets on static display as much as possible to talk to spectators, take pictures with fans, etc. Then we prep the jets and fly in the late afternoon. After flying, go to the performers desk to sign autographs (if anyone wants one) and talk to more people. 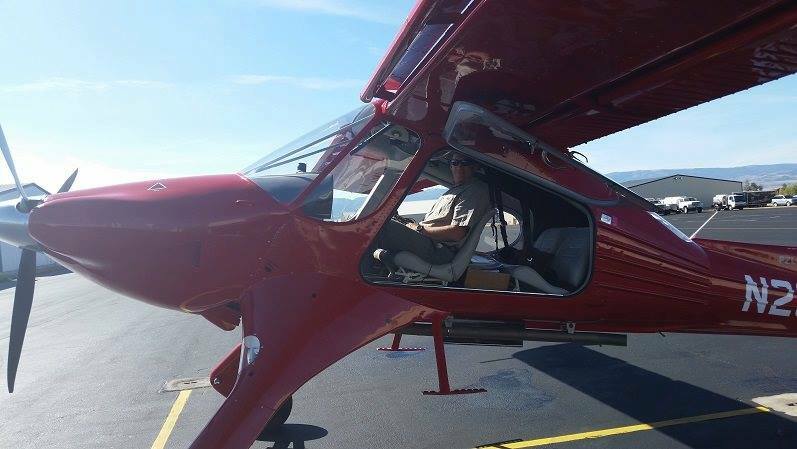 Everyone has great things to say and is envious of what we get to fly. We appreciate all of the kind words and hope to inspire others to fly, especially children. After the show ends at 4:30 it’s time to start thinking about returning the jets back to Redmond, Oregon, a whopping 25 NM away. We run into another pilot we know, a flight instructor and former student of Sean’s named Austin. It’s Austin’s lucky day as he ends up getting a ride home in the back of the L-39 with Sean. I fly lead and we join up and do a low formation pass over the airport to say goodbye to the Airshow of the Cascades 2017. Even after leaving the airshow we are able to inspire a fellow aviator with new and exciting experiences flying a warbird in formation. So we had a blast being airshow performers! I felt like I was constantly going 100 miles an hour on the ground since I was always busy doing something the entire weekend. Flight preparations, briefings, talking to spectators, family and friends, finding time to eat, etc. kept us very busy. After the show comes party time. This all makes for long, busy, fun and tiring days. Don’t forget to get some rest. Everyone at the Airshow of the Cascades, from the committee to all of the volunteers we encountered were fantastic. Everyone is very friendly and willing to help in any way they can. We are thankful for all of the support and great company. Thanks to David Robinson, CEO of AFD, for letting me fly his Fouga in the airshow. I am grateful for the opportunity. What’s next? Well we certainly want to do that again! The airshow committee was very happy with what we did in the air and on the ground and wants us back. So I will get my formation card and hopefully we can manage to get our SAC cards. That takes money and time (as all things in aviation). Hopefully we can make it happen then we can do much more in our performances. Maybe David and possibly a fourth pilot will join us and we will do a 3- or 4-ship routine? There is much to figure out but why not dream big? We have the talent in our group to do bigger and better performances so who knows. Airshows are great events and attending one as a performer is a bucket list item completed. Its All About the Flying!